In Civilization and Its Discontents, Freud writes about the ways in which civilization, which forms as a protection for humans, meant to provide them with security and safety, becomes an institution that creates misery and madness. The same came be said of the family. A nuclear unit of parents and children meant to provide security, protection and nurture too often fails, instead delivering up trauma that drives people to all sorts of aberrant coping strategies. 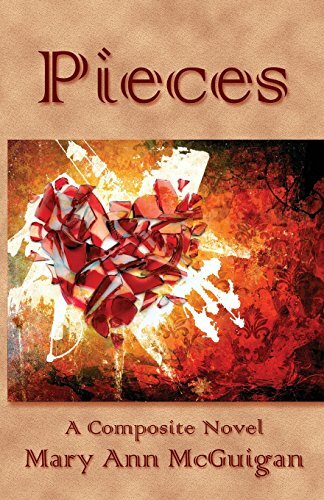 Pieces, by Mary Ann McGuigan, tells the stories of such children, exploring the root causes of their trauma, the ways in which their coping strategies become their own demons, and then explores the ways that those traumatized children, as adults, in turn damage their own children. Called a “composite novel,” the book is delivered in pieces, shaped as stories which could stand alone, but when compiled, form, through accretion, a many-layered landscape, populated by several generations of the Donnegan clan. Each “piece” explores particular experiences of damage, heartbreak, violence and ruin which inform and drive the individual characters. At first, you might think this is one of those stereotypical dysfunctional family collections. Even one of McGuigan’s characters, Kevin Donnegan, himself a writer of fiction, finds himself paralyzed creatively, despite an O’Henry Award and some early acclaim, asking just how many such books the world needs or wants. The world needs Pieces. Yes, it tells stories that might seem familiar: the alcoholic, violent father who terrorizes his family. The long-suffering, strong but ineffective mother who can never protect her children from all the layers and levels of trauma being inflicted upon them. The children, each taking up their role in this den of madness, bonding in the ways that only suffering and war cause humans to bond. But in McGuigan’s hands, these characters become multi-dimensional, fully “felt” by the reader. Each cope in ways the others can psychoanalyze; each battle their own dark urges; each carry memories and damage; they all hold deep, life-long suspicions about the world in general. We all escape our worst memories in fairly predictable ways. Some turn to religion, some to addictive substances, some to workaholism, some to art. Those, believe it or not, for all the misery they might bring to others, are the lucky ones. It’s those who try consciously to live as if they are “normal” without fully understanding that there is no such thing, are the ones destined for the worst explosive failure. All these choices are delivered with compassion in Pieces, as we watch the mother, Maureen, with her apartment filled with the statues of saints, the youngest daughter Moira survive a failed marriage through intense professional ambition, older brother Liam duplicate his father’s alcoholism and violence, brother Peter with his business success, sister Bridget with her obsessive compulsive management of an immaculate and rigidly run home. We know these people. We are these people. In them, we recognize pieces of ourselves. We learn through them that addiction’s grip is deeper than what most non-addicts will ever understand. The youngest son, Conor, tries to understand his dying father’s inability to stay sober, to clean up his life. Why, he wanted to know, couldn’t he have done it for his children? In the story “Intercession,” mother Maureen, now in her eighties and living alone, relives many of her own failures, and sees the absurdity of a religion that protects you from nothing. Instead, it offers up endless examples of ways to suffer. Ultimately, each “piece” in Pieces is a human being, but also a shard that splintered away from wholeness because of suffering. Each Donnegan might be an actual being operating in the world; yet each one is but a piece of what they could have been, a piece of what a whole family could have helped them become. The way trauma victims fracture into dissociative parts, a family fractures into dissociated humans, never fully able to retrieve their wholeness, except, we discover, through reconnecting with each other. In other words, Pieces, tells us: If family is our path to hell, it can also be our path to salvation.